MARYSVILLE, Wash. -- A student recently crowned freshman class Homecoming prince walked into his Seattle-area high school cafeteria on Friday and opened fire, killing one person and shooting several others in the head before turning the gun on himself, police said. Witnesses said the gunman, identified by a law enforcement source as 14-year-old Jaylen Fryberg, was staring at students as he shot them at Marysville-Pilchuck High School just after 10:30 a.m., local time. CBS affiliate KIRO in Seattle reported that Fryberg was upset after breaking up with a girl. Police said he died from a self-inflicted gunshot wound. "We are confident there was only one shooter and the shooter is deceased," Marysville Police Commander Robb Lamoureux said. A female student, whose identity was not released, died at the scene. Two other girls are in extremely critical condition with gunshot wounds to the head at Providence Regional Hospital in Everett. "We have dreaded this day in this community, but we were able to handle them if they came," said Dr. Joanne Roberts, the hospital's medical director. Two teenage boys, both identified by KIRO as cousins of the gunman, were being treated at Harborview Medical Center in Seattle. Andrew Fryberg, 15,was in critical condition with gunshot wounds to the head. 14-year-old Nate Hatch was in serious condition after being shot in the jaw. Authorities recovered a .40-caliber Beretta handgun, believed to be Fryberg's weapon. Marysville Police Chief Rick Smith said investigators successfully traced the origin of the gun and that it was legally acquired. Students and parents said Fryberg was a freshman who played on the high school football team. He was named to the school's 2014 Homecoming court just weeks ago. However, a source who knew Fryberg told KIRO the teen had recently been bullied, pushed around, and suspended from school. Another said Fryberg was suspended from the football team for fighting during a practice. Fryberg had sent a message from his Twitter account on Thursday that said "It won't last...it will never last." Even so, Nathan Heckendorf, a 17-year-old junior, told the Associated Press he saw Fryberg Friday morning before the shooting and there was nothing to indicate he was upset. "He looked happy, everything seemed fine," Heckendorf said. Inside the cafeteria, witnesses described Fryberg as methodical. Brian Patrick told the AP his daughter, a freshman, was 10 feet from him when the shooting occurred. She ran from the cafeteria and immediately called her mother. Patrick said his daughter told him, "The guy walked into the cafeteria, pulled out a gun and started shooting. No arguing, no yelling." Malia Grato, a junior who had been inside a classroom, said she heard a few pops but didn't realize something was seriously wrong until teachers started shouting that there had been a shooting. "It was scary because it's happened in a lot of schools, but you never really imagine it will happen in yours," said Grato, who said she was friendly with Fryberg and described him as a quiet, good guy. 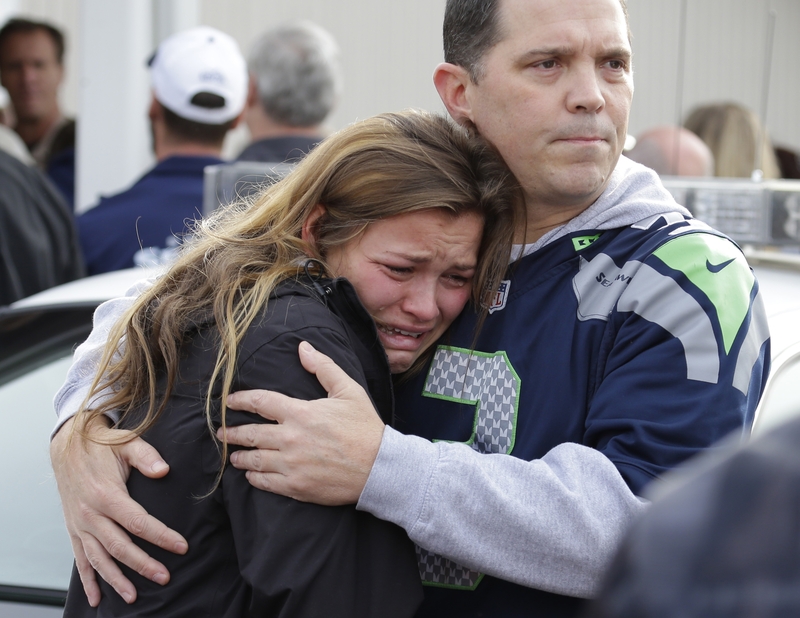 The shootings set off a chaotic scene as students ran out of the cafeteria and building in a frantic dash to safety while others were told to stay put inside classrooms at the school, 30 miles north of Seattle. Cedar Parker, a 17-year-old senior, said he was driving away from campus when the shooting happened. He let several students into his car as he heard others yelling for their friends: "Where are you?" A crowd of parents waited in a parking lot outside a nearby church where they were being reunited with their children. Buses pulled up periodically to drop off students evacuated from the school, with some running to hug their mothers or fathers. Patrick said after the shooting, his other daughter, a senior at the school, called him "hysterical" from her classroom. "I thought, 'God let my kids be safe," he said. Marysville-Pilchuck High School has many students from the Tulalip Indian tribe. Ron Iukes, a youth counselor with the tribe, said Fryberg was from a well-known tribal family. "They're real good people, very loving, a big part of the community," Iukes said. "Jaylen was one of our good kids. It's just a shock this happened. I've known this boy since he was a baby. It's just devastating." "I do know the family," McCoy said. "We're all related in one shape or form. We live and work and play together." FBI spokeswoman Ayn Dietrich said the agency was assisting local law enforcement and providing specialists to work with victims and their families.